One of our family rules is that we can each have one treat a day. The toddler generally follows this rule with a few promptings and reminders throughout the day. So last week when my sister visited we baked some cookies with the boys and I was certain the toddler would pick those cookies for his treat. Instead, he decided on a slice of leftover birthday cake and so that was his treat for the day. When I left the kitchen, apparently my sister offered the toddler a cookie to which he quickly inhaled. And….I’m guessing that’s the last time his aunt “sneaks” him an extra treat. ? 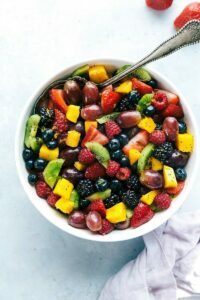 This salad is what I consider a summer “treat.” It’s not the healthiest of salads, but gosh it is so good and such a delicious summer indulge! It’s tangy, sweet, and crunchy. 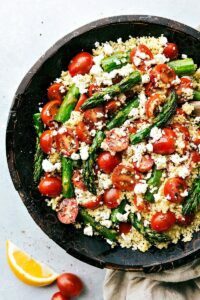 The flavors are phenomenal and it’s perfect for a summer potluck or party! 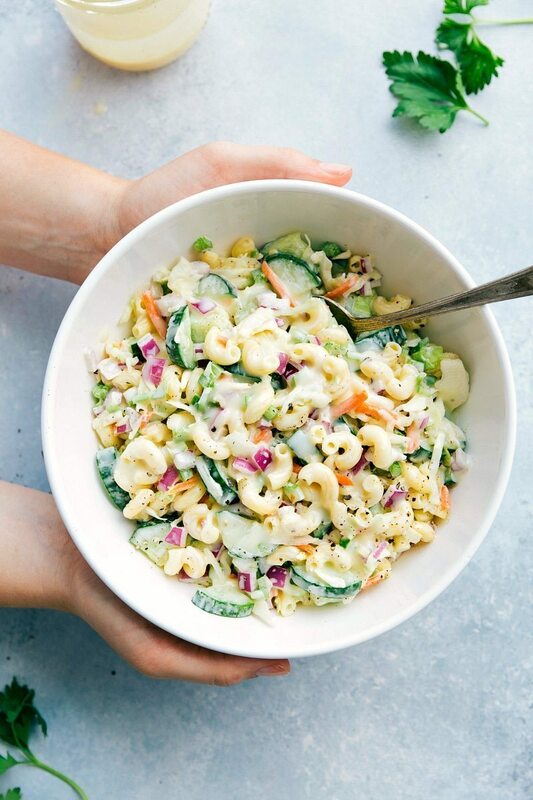 Essentially this salad is a mash-up of coleslaw and macaroni salads with tons of veggies and a quick homemade coleslaw dressing. This salad tastes best after being chilled for a bit in the fridge. It gives a chance for the vegetables to soften a little and the flavors to all meld. 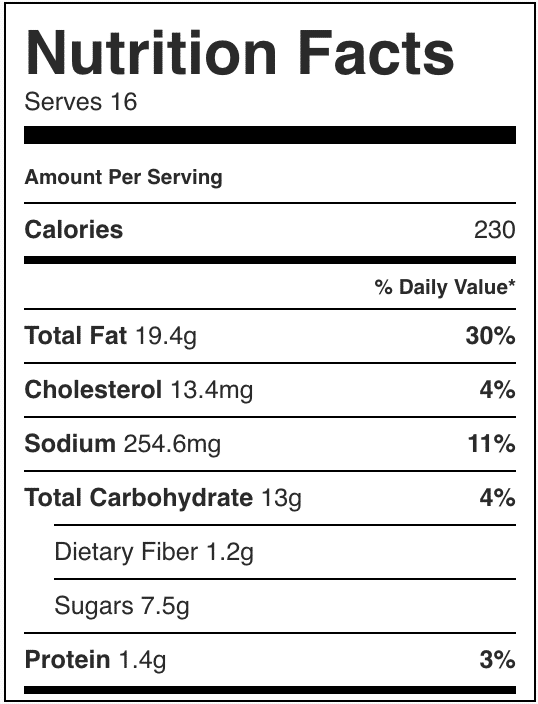 If you are sensitive to red onion, be aware it does intensify the longer this salad sits in the fridge. 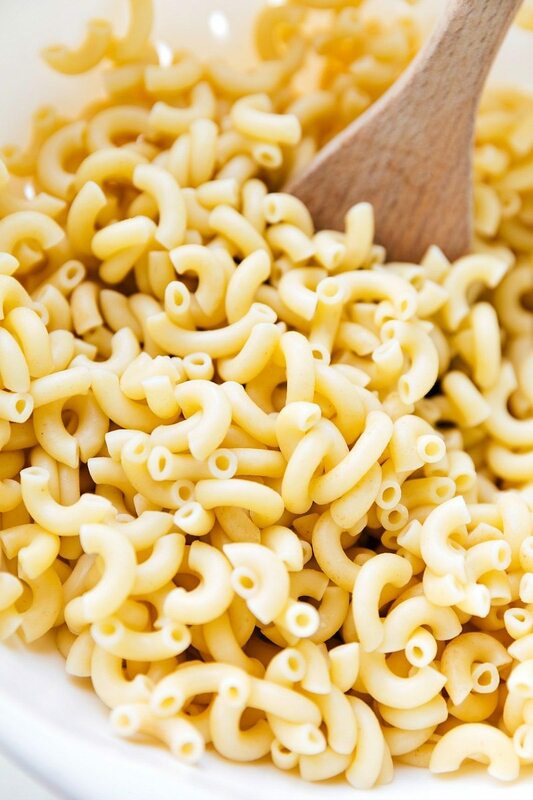 Cook the macaroni noodles according to package directions; drain and rinse in cold water and then transfer to a large bowl. Toss with 1/2 tablespoon apple cider vinegar. Meanwhile, prepare the veggies. Remove about an inch of each end of the English cucumbers. Halve the cucumbers so you have 4 cucumbers. Slice each cumber in half and then cut the halves into moons. Add to the large bowl with the macaroni noodles. 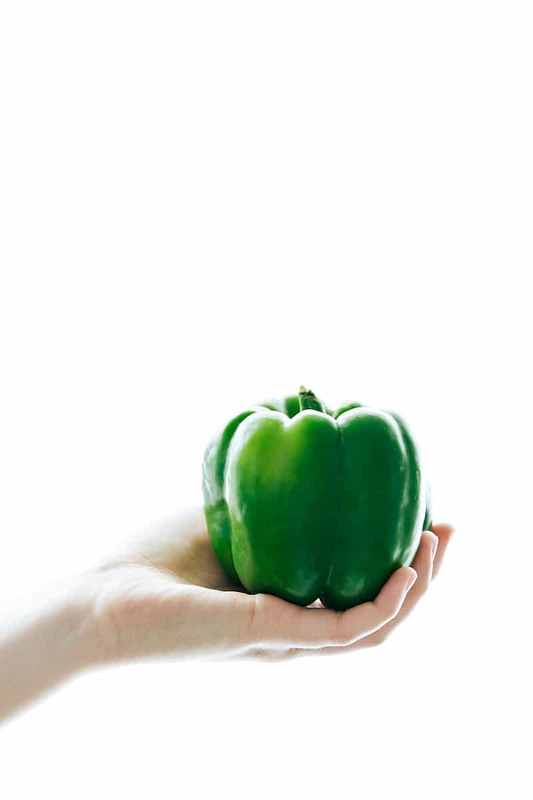 Finely chop the green pepper and add to the bowl. Finely chop the celery and red onion and add to the bowl. Add in the coleslaw mix and toss to combine. Meanwhile, add all of the dressing ingredients to a small bowl. Whisk to combine. Pour over the salad and toss until all the ingredients are well coated. Cover tightly and allow to chill thoroughly in the fridge for at least 30 minutes and up to 1 hour before enjoying. Toss right before serving. That is the best-looking coleslaw! I’m saving the recipe. Anxious to try it out! 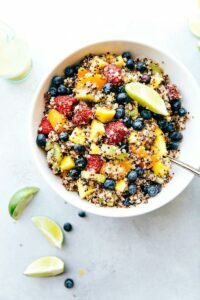 You have the yummiest dishes! 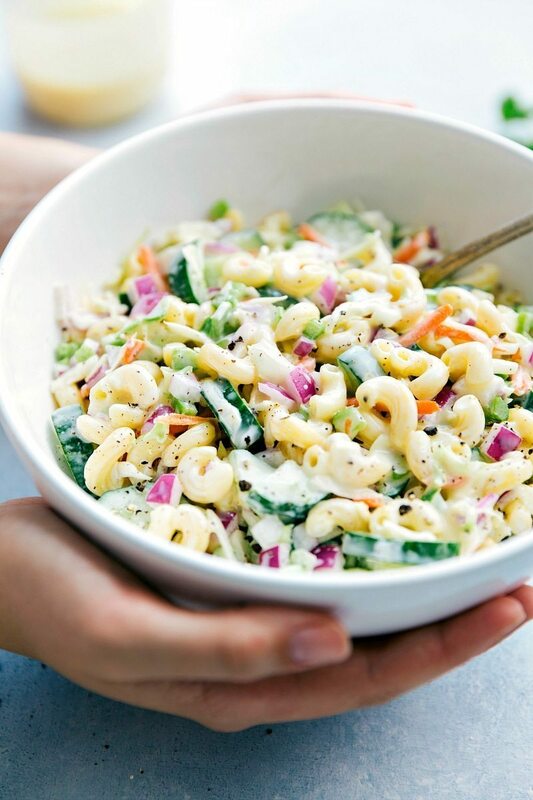 Love this new Macaroni Coleslaw Salad recipe you just shared. Perfect for those hot summer days! 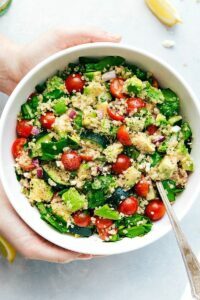 And there’s so much to love about this gorgeous salad!!! Really great combo of ingredients!! What a great idea and combination! I always use red and yellow peppers instead of green. I can’t wait to try. Thanks! I have saved many of your recipes! You state best if served same day, how long is the salad good for? I am planning to take for lunch for 4 days, would it be good that long? Thanks!!!! Hi! If using store-bought dressing, how much should I use? Thanks! Macaroni is my son’s favorite food. I often make mac and cheese for him at home. Yours looks nice, try it soon. This is delicious! Since there’s just two of us I cut the recipe in half and only dressed half of what I made, saving the rest to dress and eat in a few days. The only change I made was to seed the cucumber and cut it into smaller pieces. 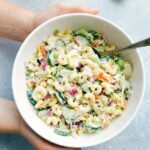 I had stopped making pasta salad because of medical issues that require a very low sodium diet, and this recipe allows us to enjoy pasta salad again! Thank you so much! This is definitely a keeper! Awesome recipe, i didnt remeber to separate dressing fir another day, however, i took left over for lunch, hopefully i get to enjoy the rest, thank you! This is delicious i made it today!! You mention its not the healthiest but i think it sort of is…lots of good veggies in there…i also use organic sugar and 1/2 mayo and 1/2 plain greek yogurt…thanks for a great recipe ?